This week, three inches of snow “paralyzed” the ninth-largest city in the United States, and the highways of Atlanta “resembled a scene in a post-apocalyptic world” according to national news reports. Hundreds of cars were abandoned on the side of the road, people were spending the night in churches and grocery stores, and many walked for hours in a desperate attempt to get home or find needed provisions. So if three inches of snow can cause this much chaos in one of our major cities, what will a full-blown economic collapse look like? Most Americans have no idea how fragile our way of life is. In the event of a major natural disaster, a massive EMP blast or a complete economic meltdown, our lives would change very rapidly, and most people are totally unprepared for that. The usually bustling roadways in the Atlanta metropolitan area resembled a scene in a post-apocalyptic world during and after Tuesday’s snow and ice storm. “It was a like a scene from The Walking Dead,” said Maura Neill, 38, referring to the television series about a post-apocalyptic world overtaken by zombies. “I’m eight months’ pregnant and have my 3-year-old with me,” Atlanta-area resident Katie Norman Horne said on SnowedOutAtlanta, a Facebook page set up to help stranded motorists. In Atlanta, 940 accidents were confirmed, with more than 100 of them involving injuries, the Georgia public safety commissioner said. In Alabama, at least five people died Tuesday in weather-related traffic accidents. The governor deployed 350 National Guard troops to help motorists. 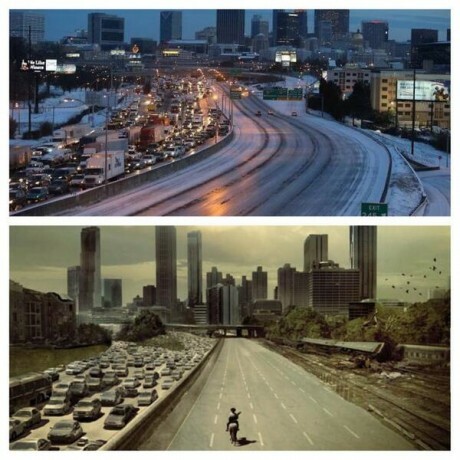 You can see some incredible pictures from the “snowpocalypse” in Atlanta right here. Remember, this was just a temporary “emergency” caused by just three inches of snow that everyone knew would soon pass. So how will people respond when a real crisis strikes that is not temporary? We live at a time when we tend to think that we are invulnerable because of our technology. The governor of Iowa, Terry Branstad, has called on President Barack Obama to act as bitter winter weather caused a shortage of propane heating fuel and a massive spike in prices in some of the coldest regions of the US. Propane is used by more than 12m households across the country, according industry statistics, and its shortage has led to a state of emergency being declared in more than 30 states. Prices are up more than 17% from a year ago, according to the US Energy Information Administration. Ahead of the president’s State of the Union speech, Branstad has written to Obama expressing his concern about a crisis now sweeping the midwest: “Prices in some midwest locations have now exceeded $5 per gallon. Such prices are unsustainable for families, farmers and businesses,” he wrote. So what would happen if a real crisis happened? For instance, what would happen if something caused the trucks in America to stop running? Sadly, most Americans have made absolutely no preparations for a major crisis of that magnitude. They just have complete and total faith that the system will always be able to take care of them. Someday when we do experience a great national crisis, those people will be totally blindsided by it.